2011 – Liszt’s Année de Pèlerinage. 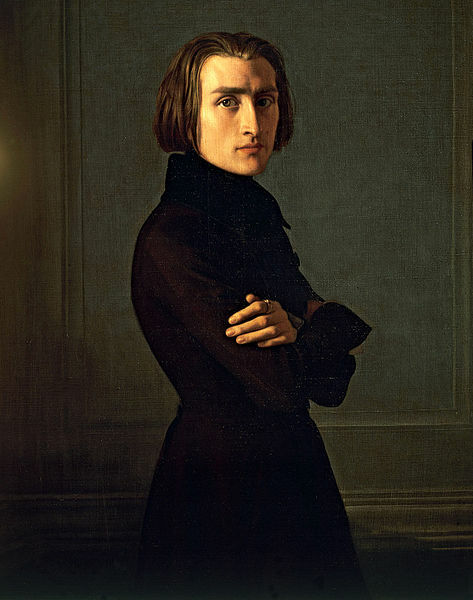 On 1 June 1835, Franz Liszt departed from Paris on a public coach bound for Switzerland; he was to meet Countess Marie d’Agoult in Basel, who had left her husband and daughters for him. Their life together lasted for four years; they lived in Switzerland, France and Italy, and had three children. Their final split occurred in 1844. Some of the places they visited, the literature they read and the art they viewed inspired pieces in Liszt’s first two volumes of his ‘Années de Pèlerinage’. I hope to discover the background for the pieces, blog about them, and record some. Also, I’ll investigate other works, and Liszt’s writings. But it’s not all Mozart on Radio 3 on New Year’s Day; there’s the annual New Year’s Day concert from Vienna, featuring much music by Strauss – including Johann Strauss’s Furioso-Galop on Themes by Liszt. Oh dear. This is what Liszt has to put up with. Thankfully, Liszt’s Mephisto Waltz No 1 is also programmed; it describes the episode from Lenau’s Faust where Faust and Mephistopheles visit a country inn. Mephistopheles grabs a violin from a member of the local band and whips the music up to a frenzy, enabling Faust to pair up with a beautiful girl, waltzing with wild abandon out of the room into the nightingale-filled woods. Who can resist this piece, either orchestrally or in its piano solo version, with its rhythmic energy and imaginative ‘tuning up’ in 5ths at the beginning, its rustic bonhomie, its seductive melodies, its demonic fiddling and/or pianistic bravura?! This entry was posted in Composers, Liszt - Years of Pilgrimage, Three Volumes, Places and tagged Années de Pèlerinage, Arts, Franz Liszt, Mephisto Waltzes, Mephistopheles, Music, New Year's Day, Switzerland. Bookmark the permalink.